Digital pathology is a picture based environment which allows the storage and management of information generated from the digital slide. Digital pathology provides various kinds of environments such as scan, view, manage, network, analyze, integrate and sharing. Digitization of tissue slides offers pathologist ease of diagnosis and detection of disease. Further, digitized tissue can be analyzed by computer algorithms. This results in less human error and high efficiency. Apart from this, the digitized tissue can also be stored and further used for educational purposes. Digital pathology is gaining traction among hospitals and research laboratories due to above mentioned advantages of digital pathology over conventional pathology. The global digital pathology market is flourishing due to the rise in expenditure in healthcare industry. The various countries such as U.S., Canada, and Germany are increasing the encouragement of technologically advanced healthcare products in order to provide better healthcare services to their citizens. As a result, the adoption of digital pathology is rising in the developed and growing economies. The digital pathology market is expected to flourish at a CAGR of 11.6% during the forecast period of 2016-2023. The market growth will be driven by the rising number of chronic diseases. Further, the rising adoption of digital pathology system by the research laboratories and hospitals is expected to expand the market growth. The growth of the digital pathology market is primarily driven by the rising number of chronic diseases patients across the globe. 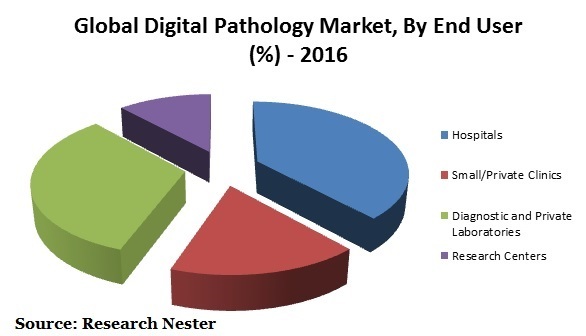 Further, rising awareness towards diagnosis and increasing healthcare expenditure is expected to fuel the growth of global digital pathology market. Increasing gross disposable income is expected to drive the market of digital pathology in developed and growing economies. Apart from this, the technological features of digital pathology such as cloud technology integration are envisioned to bolster the growth of the digital pathology market over the forecast period. However, high cost associated with integration and implementation of hardware & software of digital pathology, especially in small clinics & private laboratories is likely to restrict the growth of digital pathology market. Additionally, high cost of diagnosis test compared to conventional pathology test is curbing the growth of digital pathology market.